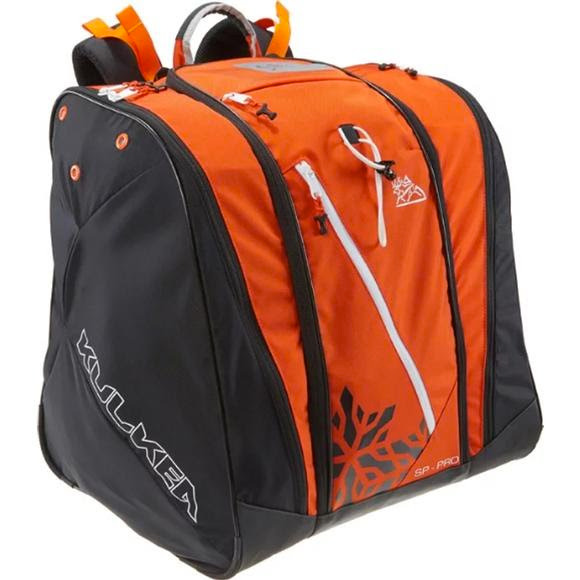 Large front loading, travel-ready performance ski boot bag backpack for alpine ski boots, helmet and gear. Extra-tall boot pockets, perfect for racers. Two contoured triple grommet ventilation, four paneled side boot pockets. Two contoured, ventilated front opening side boot pockets for smarter packing. Padded and contoured adjustable Shoulder Straps combined with a padded spacer mesh back panel, heavily reinforced Lifter Straps and a Sternum Strap. Shoulder Straps dislodge buckles for simple pack removal. Extra large hybrid pocket with visibility into the Central Compartment for quick, organized packing of ski pants, tops, base layer, helmet and gloves. Stores face masks, balaclavas and bandanas. Zippered inner pocket with transparent lining stores sunscreen, lip balm, hand warmers, snacks, tools and personal items. Durable, water-resistant Tarpaulin (TPU) bottom. Strategically located, soft material hanging pouch for the ultimate goggle protection. Easily attached a jacket to the pack&apos;s exterior. Write your name or mark the backpack as your own on this designated panel. The shoulder straps and waist belt may be tucked behind the back panel for airline baggage check. Extended zipper pulls for easy use with gloves. Looped webbing strap ends for attaching karabiners and other items. Two coated drainage grommets on Boot Pocket bottoms. Bar tacking on major stress points for added reinforcement. Dimensions 19.5" x 15.5" x 18"